“This book looks boring, doesn’t it?” This question arrives at the beginning of Nothing Happens in This Book, amid an expanse of darkness. Yet neither this recurring note of skepticism, nor the proleptic title, are to be trusted. 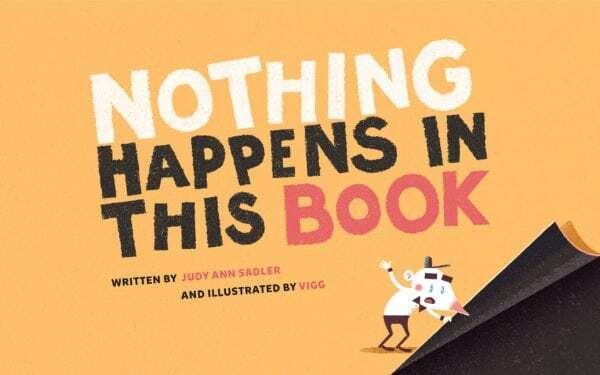 In the second picture book written by Canadian author Judy Ann Sadler, pessimism grades into excitement. Our bow-tied narrator soon emerges, with lantern in hand, and continues to forecast boredom. The ensuing pages instead offer mysterious objects, which propel narrator and reader alike toward the joyous conclusion: a circus parade bustling with a farrago of characters. The narrator’s negativity slowly yields to enthusiasm, and Sadler’s story becomes a celebration of inquisitiveness and optimism. Vigg, an illustrator based in Quebec, provides the spare visuals. His minimalism brings the essentials of each scene into lively relief. There is often a terrific sense of atmosphere, too. In one scene, an improbably large baton is extended across facing pages. The narrator, with lantern outstretched, resolves nearly into a silhouette, and is dramatically poised at the edge of the surreal discovery. Each finding is staged against fine-grained backgrounds, whose textures often suggest the dimly lit surroundings, and the lantern’s unsteady flame. The varied larks of a droll teddy bear also unfold, wordlessly, alongside the narrator’s adventure. Early on, while the narrator puzzles over a shoe, the bear spies an irresistible opportunity: It appears to stagger-walk over to the lantern, where it strikes a pose and casts a humorous shadow across the page. The story’s mysteries eventually taper into a spirit of reunion and pageantry. The items are kindly restored to a circus of merrymakers — which includes, among other visual surprises, a rather magnificent tiger — and the festivities begin. At this point, Vigg’s subdued style gives way to a densely detailed parade scene that unfurls across a gatefold spread. The crush of paraders makes for a fun spectacle; but the unelaborated backgrounds seem a tad incongruent. The expressive shadows from the beginning eventually disperse to reveal plain swaths of colour. The simplicity had paired well with the story’s mysterious, expectant qualities, but seems at odds with the momentous finale. A children’s story that begins in darkness before gradually gathering up detail necessarily suggests the possibility of an entire world eventually materializing. A blossoming of actual surroundings, in addition to the paraders, would have nicely amplified the concluding spectacle. The promise of Sadler’s conceit finds slight resistance, then, in the persistent abstraction of the backgrounds. Missed visual opportunities aside, the narrator’s journey from doubt to delight is surprising, silly, and rewarding. The instructive appeal of Nothing Happens In This Book lies in the way it honours the value of curiosity. Acts of kindness and celebration, the book hints, are among the potential rewards awaiting those who look beyond expectations of boredom.